The Carlsbad Gentle Dental is conveniently located in the Carlsbad Plaza South Shopping Center on S. El Camino Real between Marron Road and Hospital Way. We offer flexible hours for your convenience, including evenings and weekends by appointment, and accept most insurance plans. For those without dental insurance, we offer our Dedicated Dental Plan that provides low-cost preventive and diagnostic care, as well as discounts of 20 percent or more on most dental treatments. We also have flexible payment plans and financing available as needed. Our friendly team of dental professionals is eager to put a smile on your face by providing sincere and compassionate care. We offer gentle, personalized family dentistry for patients of all ages, including pediatric and teen dentistry. 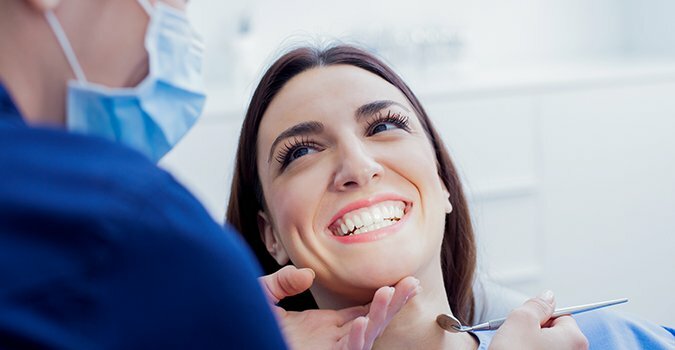 Our skilled team of dentists can help you with all types of general dentistry, orthodontics, cosmetic dentistry, dental implants, oral surgery, endodontics and root canals, and much more. We also offer sleep sedation by appointment. Give us a call for more information on this special service. Close proximity to Camp Pendleton, we cater to military families or Active Duty Service members accepting both Tricare Dental programs for dependents and Active Duty Dental programs for active service members. Stop in and see us on S. El Camino Real. We offer convenient, handicapped-accessible parking. To set up an appointment or for further assistance, please call us at 760-552-8834. One of our friendly staff members will be happy to speak with you. After graduating from the University of Michigan, Dr. Hwang received her Dental Degree from the University of Michigan School of Dentistry. To keep up with evolving technology, she’s a member of many organizations including the American Dental Association and the California Dental Association. She also speaks Korean. Dr. Hassan says, “As a Periodontist, I enjoy providing my patients with thorough evaluations and informative solutions. I help them decide for themselves what is ultimately in their best interest. Their choices can have a very positive impact on their well-being.” Dr. Hassan feels that building a foundation of trust by treating his patients as special individuals is vital. He understands how uneasy some patients may feel about their dental visits, and how he can make a difference in providing a relaxing and comfortable experience. Dr. Hassan received his Dental Degree and his Advanced Periodontics Specialty Certificate from the dental school of the University of Southern California, (USC). Dr. Hassan is a Diplomate of the American Board of Periodontology. He also speaks Spanish. When Dr. Hassan is not helping patients, he enjoys jogging, reading, and traveling with his family. Dr. March says, “My favorite part about dentistry is being able to positively affect people’s lives. I enjoy helping patients out of pain and creating beautiful smile with my hands.” Dr. March tries to create a welcoming and comforting environment by treating each of his patients like family. After graduating from Wesleyan University with a major in Biology, Dr. March received his Dental Degree from the University of the Pacific School of Dentistry. He’s a member of the American Dental Association, the California Dental Association and the San Diego Dental Society. Aileen and her staff are awesome! They have been taking care of my daughter and I for years. Dr March, Dr Hwang and Joy, our hygienist, are very caring and patient. The front office staff is very friendly. Highly recommend! Joselyn Manalang, your satisfaction is our top priority. Briana Ford, we're happy to hear you've had such a positive experience with our team! I love this place! Everyone is super nice and helpful! I have been going here since I was younger. I had to switch a few times and I always loved this place the most! The staff were very helpful here. I currently get my ortho treatment and they take care of their patients here! Awesome dental office! All the doctors and staff are wonderful. I feel so at home when I visit this office. I highly recommend Dr. March and Dr. Hwang for all your dental work. Tricia Dimacali, we strive for 100% satisfaction, and it is great to see you had such a positive experience at Gentle Dental Carlsbad. Dear Tricia Dimacali, Thank you for taking the time to post your kind words about our staff. We are excited to share this with the team. At, Gentle Dental Carlsbad, it means a lot to us to know you had a great experience and we look forward to seeing you on your next visit. Fantastic dentist! Extremely friendly and gentle like the name says! Always welcomes you with smiles, plus its always a great day when you have no cavities!!! Love this dental office in Carlsbad! Aileen the office manager explained my treatment plans detail by detail! I told her I needed to think about it and she didn't pressure me like other places. I finished my treatment today and love the out come. Thank you Aileen and thank you Dr. Hwang for the great job you did on me !! Dear Sendy Vargas, Thank you for taking the time to post your kind words about our staff. We are excited to share this with the team. At, Gentle Dental Carlsbad, it means a lot to us to know you had a great experience and we look forward to seeing you on your next visit. I was hesitant to switch to another dental office since I have been with my previous one for more than 10 years. I was referred by a family member to Gentle Dental in Carlsbad with an emphasis of how good their dentists and staff are. I gave it a try; they exceeded my expectations. I only have great words for the whole team of Gentle Dental Carlsbad. I now have a better understanding of how important oral hygiene is. Nevertheless, I am happy with the service I received and I will always be grateful for having been seen and treated at this dental clinic. It is worth every penny to be healthy and I need not whine for anything that is beneficial for me in the long run. Dear Dennis Villareal, Thank you for the delightful feedback. At the Gentle Dental Carlsbad, we are glad that the team has put you at ease and taken great care of you during your visit. Your review means a lot to us and we look forward to seeing you at your next visit. I haven’t been to the dentist in a while so I was really nervous about going, especially to a new one where I didn’t know what to expect but every person I talked with was so welcoming and friendly! I have a few problems with my teeth that I need fixed but they made me feel comfortable and I didn’t feel judged what so ever! Great first experience. Staff was welcoming, friendly and knowledgeable. Excellent customer service, great dentists, very smooth experience! Very friendly people, doing great job. Very good and clean office. High tech euipment in place. There panoranic x-ray system is very impressive. Pleasent to be there. Bringing my wife to this office! Hi Sandia Filter, we are very happy to have provided you with such a positive experience! The staff was very helpful, thorough, and friendly. Great experience!! Joy is the best hygienist I've ever had and I have going here for years because of her. Eileen is a very competent business manager. Ashley Nunez, we're glad to hear you enjoyed your visit.